Liv. 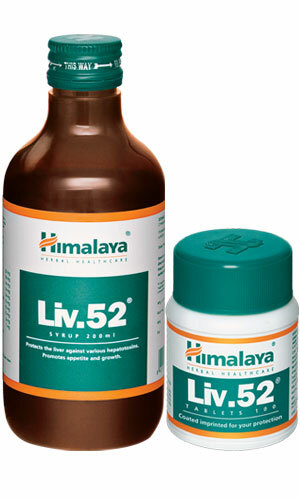 52 was introduced in 1955 as a specially formulated proprietary herbal formula for healthy liver support. It is recognized by thousands of health professionals as one of the most effective liver support formulas proven with 182 clinical studies. Known to normalize the basic appetite-satiety rhythm. Aids in improving appetite, digestion and assimilation processes and promotes weight gain. Liv. 52 assists normally functioning liver cells. Has antioxidant properties that support liver cell integrity and is a formula which assists in preserving existing liver strength. Filters out environmental toxins from daily exposure. Helps maintain liver health of athletes who specialize in anaerobic sports (e.g. weightlifting) and consume high levels of protein. Safe for long-term use. Contains no milk thistle. No side effects. Infants: 5 to 10 drops (0.175 to 0.35 ml) three times a day. Children: 10 to 20 drops (0.35 to 0.70 ml) three times a day. Infants: 5 to 10 drops (0.5 ml) three times a day. Children: 10 to 20 drops (1 ml) three times a day. Children: 1 teaspoonful (5 ml) three times a day. Adults: 2 teaspoonfuls (10 ml) three times a day. 2 to 3 teaspoonfuls (10 to 15 ml) three times a day. Children: 1 teaspoonful (5 ml) two to three times a day. Adults: 2 teaspoonfuls (10 ml) two to three times a day. Children: 1 tablet three times a day. Adults: 2 tablets three times a day. 2 to 3 tablets three times a day. Drops: Pilfer-proof bottles of 60 ml and 100 ml. Syrup: Pilfer-proof bottles of 100 ml and 200 ml. Tablet: Sealed pack of 100 tablets.